Cost: $250 + $15 Supply Fee paid directly to instructor. Cash or checks made out to Tracy Felix. Description: Another great opportunity to learn more about encaustics (melted, pigmented wax) from this terrific artist and amazing instructor – Tracy Felix! Generous, fun, encouraging… just a few of the adjectives students use to describe this beloved instructor! This time you’ll be learning how to make Monotype Prints – all in Tracy’s signature “renegade” style! This two-day class will provide an opportunity to create many multiples of monotype prints…. Monotype means you make one delightful print at a time. Each is a wonderful surprise and beautifully unique! 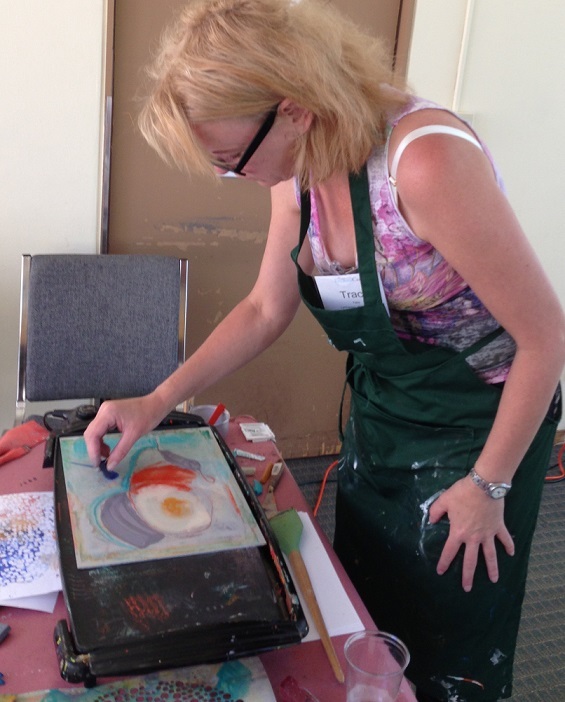 Tracy will show you how to use anodized aluminum plates, stencils and rubbings using colorful encaustic wax. Options are endless. You will have the whole weekend to play! Tracy will take you through these super fun steps one by one to ensure success for each student. Day Two: Create a collage using your favorite prints from Day One. Tracy will show you how to cut and arrange the prints, and how to adhere them to the wood panel. The final touch is adding more wax, and students are welcome to choose from a smorgasbord of finishing touches with supplies Tracy will bring to share. Plus, everything will still be out to make more monotype prints if you desire. How fun is that?! Wax on Paper - so beautiful. This class makes it super easy and fun. You will leave with at least one finished artwork ready to hang, and stacks of monotype prints you can use in other collage or mixed media work. These prints look great framed under glass too. *Are you wondering what encaustic is? It's creating art with melted, pigmented beeswax! This ancient medium is experiencing a major resurgence. Many students have taken Tracy's Renegade Encaustics classes over the years. Students love her novel approach to encaustics, with her out-of-the-box (or "renegade") way of creating art from this wonderful medium. Tracy has been teaching the short Friday evening “Try-It” classes for several years here at Cole Studio, but students wanted more! So here it is: Two FULL days of encaustics with Tracy! Choose from these sizes to work on griddles supplied by Tracy during class: 6 x 6", 6 x 8", 8 x 8", 8 x 10", 10x10"
NOTE: ARTspot has a selection of sizes in stock but not all sizes all the time! Call them early to secure the size you want. R&F - 40 and 104 ml. Tracy recommends the metallics as especially beautiful. You can always get more colors from ARTspot throughout the day if needed. Tracy will bring some colors to demo with and for students to try. Sumi paper is also available in rolls but are more challenging as they are curled up and trickier to use than the flat paper from pads. You will use a lot of paper as you make prints. You can just get one of these pads, and go over to ARTspot for more as needed. Any other lightweight papers you would like to bring to experiment printing on. Old book pages can make interesting prints. Stencil - At least one 6x6 TCW Stencil (required): Any design or pattern that appeals to you. TCW (The Crafter’s Workshop) brand holds up to the heat really well. Also available in 12x12- if you get this size choose a design that can be cut apart to make it into multiple smaller stencils to use on the griddle. Stencil Girl stencils are good too. Note: you can purchase ahead of time if you know what size you like, or wait until Day Two of class to purchase a size to fit the collage you will design with Tracy’s help. You are welcome to bring a lunch to eat in the workshop studio. Edmonds has many places to get take-out or go out to eat.